Mom Loves 2 Read: May Day Giveaway Event - low cost blogger sign ups! May Day Giveaway Event - low cost blogger sign ups! Hosted by Loves 2 Read & Mom of One and Having Fun! OVER $1000 in CASH & Prizes! we may reach $1000 or more by the time it starts! WANT TO BE PART OF THIS AMAZING EVENT? 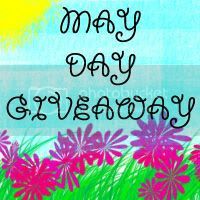 ~ have teamed together with to bring a May Day Giveaway Event. OPEN TO ALL BLOGGERS! We wanted to find a way for bloggers to boost their followers without costing "an arm and a leg." So we decided to host a Gift Card giveaway and it will only cost you $1 per social media (max 5) (or $1 per entry point up to 5). ~Then post to any other social media site you can to get more bloggers to sign up. The more that sign up, the bigger the giveaway prize will be! Right now we have over $300 in sponsored prizes and Cash - we'd love to reach $500! Sign up today, promote and post - REFERRAL PRIZE for whoever gets the most new people signed up! So start spreading the news!